i found you on the IFB fashion writers group. i have to say i really genuinely love your blog - the layout, the design, the photography, the content and the writing style. are you a designer by any chance? and do you write professionally? Thanks, really kind of you - yes, I'm a dithering architect/graphic designer/photographer/writer - you name it, I've tried my hand at it!! OK first and foremost I truly am in love with your ability at laying out a good post! This is gorgeous! Truly I thought you had scanned in the book and posted that for a few minutes before realizing it was your writing. 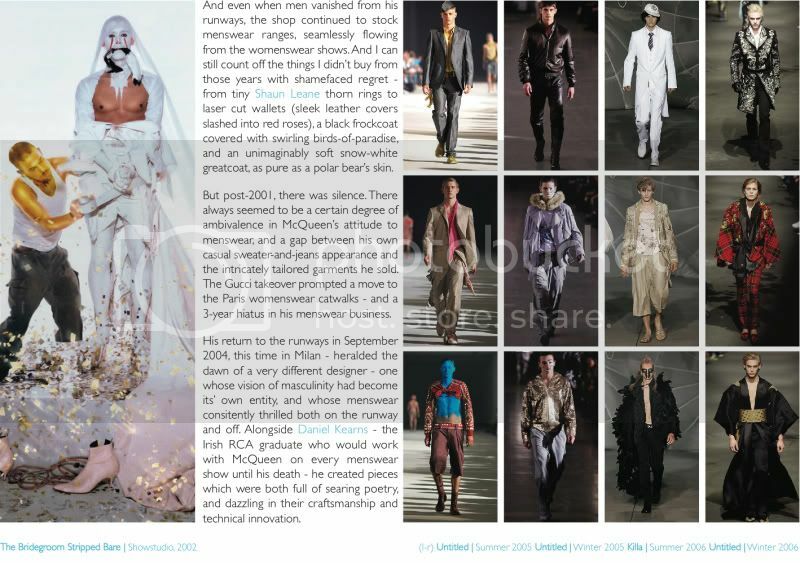 Thank you for writing about Mcqueens menswear which has sorely been overshadowed by his phenomenal womenswear. I'd love to know more about his pre-gucci mens, but that era is a tricky one to find info about. Going to the exhibit in a week or so and now I can't wait! Hey Brandon, thanks for the lovely comments! 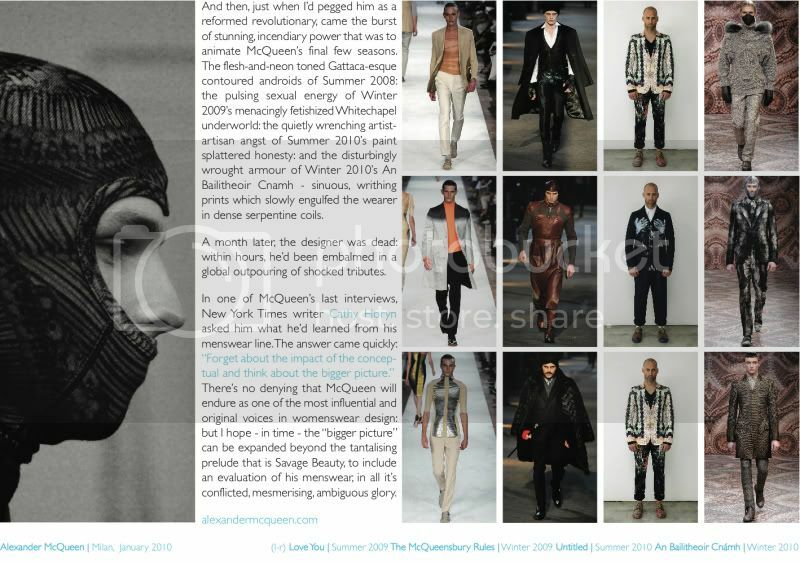 Yeah, the early years are pretty shadowy - most of the images here are from various forums on The Fashion Spot, but am sure that's not the full picture - I also didn't include Autumn 2004, which was his first post-Gucci show, as this only seems to exist as a film. The frustrating thing looking back is how little I bought - his first store opened in 1999, and we used to browse there all the time, but we always presumed it'd be around forever . . . . the early stuff was just really beautiful, and pretty romantic when everyone else was in full-on pre-millennium minimalist mode. Am trying to add to the collection now - a slow but exciting process! bravo! so well written and presented! Brilliant analysis - this is incredibly well conceptualized and very insightful! This is so great. 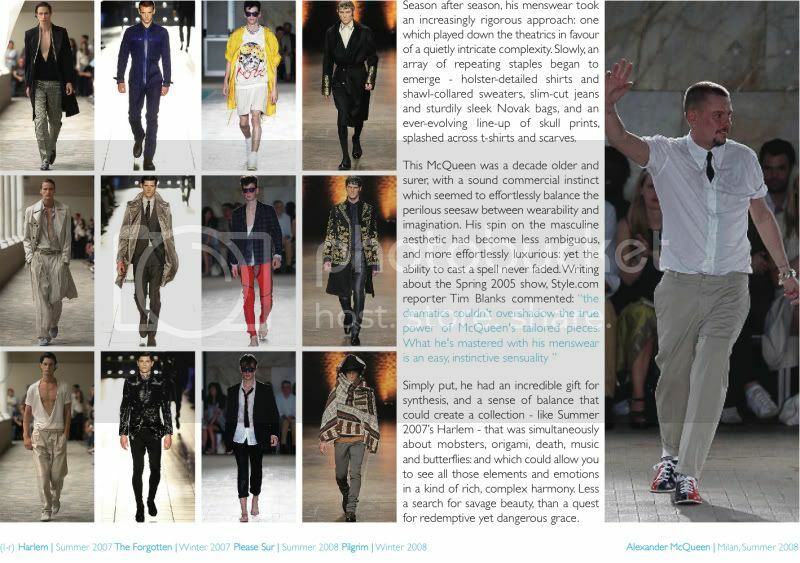 Love the writing, the layout and the insight on McQueen. 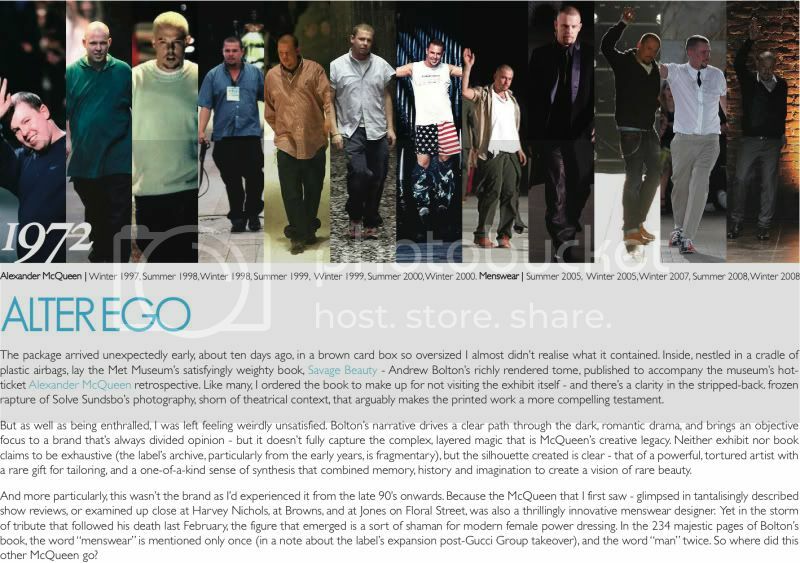 I recently posted something on McQueen myself so I really enjoyed finding your blog on the the list this week! Hi Alexis, thanks for the comments. I'm probably biased too far the other way - but I guess I was just noticing how quickly history was being re-written after his death! Wow - you really are a beautiful writer. 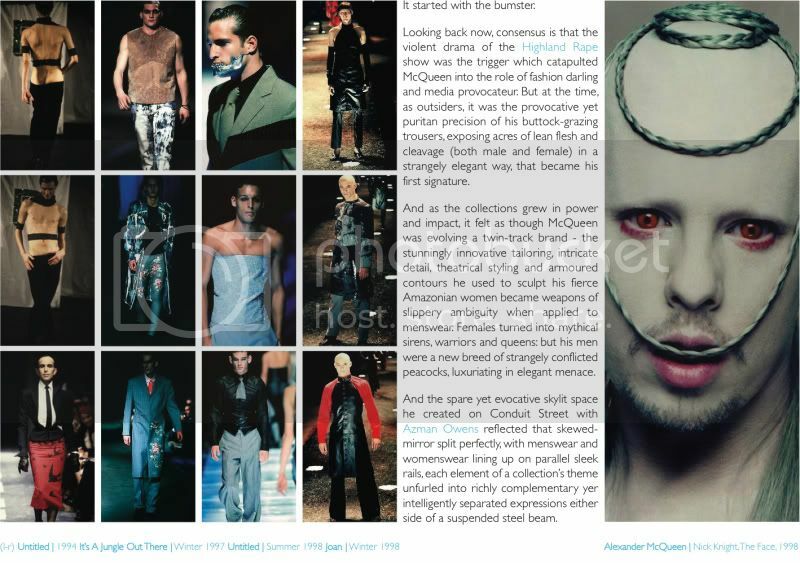 I consider myself a fan of McQueen's work, yet never even paid much attention to his menswear collections. You have made me more aware of his range of work and best of all, through a beautifully written piece that I rather enjoyed reading. THANKS! Beautifully written and presented. I have to say I've always found his menswear more than a little disconcerting, but I come away from this article with a greater understanding of it. Thank you! When I lived in Paris last, I caught sight of a man in a beautiful black skirt and another in a tartan. They were echoing McQueen's style. They were amongst the sexiest men I've seen in my life. Looking at one of the pictures you've posted, I still remember the video in which McQueen turned that trenchcoat in a wedding dress... great!! You have a great idea here 1972 but the other photobucket image can't view. well anyway i like the classic photo that you made more people viewing this blog because of your uniqueness. I'm a big fan of Alexander McQuenn and his works will definitely remembered. I haven't ever really been a fan of Dior. I would look at their ads and find them boring and not very relatable to an average woman's needs and style. And thanks to your blog I'm able to realize how a lot of their collections have lost originality and creativity. Lovely post. Congrats on Links a la Mode.